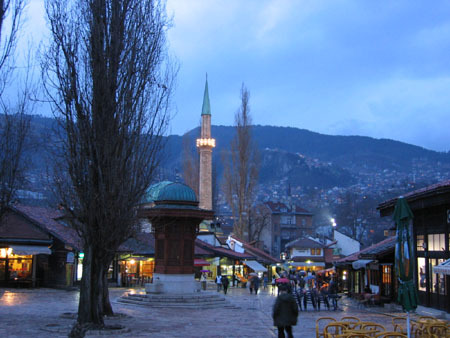 Sarajevo was city number four after Mostar, Split and Zagreb. 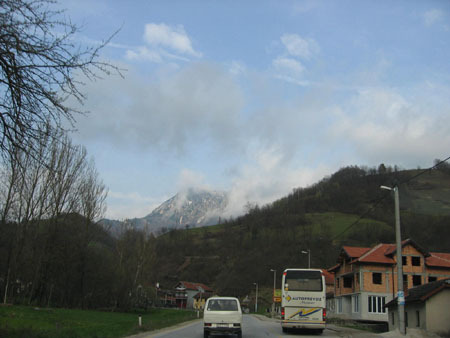 From Mostar we continued on the E73 to Sarajevo. At first it was raining but the sky cleared a little bit when we were passing the mountains. This way we could see that they were high and snow capped, rivers at the feet of the mountains created naturally or via hydro dams. In those lakes trout farms and everywhere the possibility to buy fresh trout. I would have bought some but we did not go back to Belgrade that day so maybe another time. A very nice trip with some spectaculair views, that's what you should expect on this road. 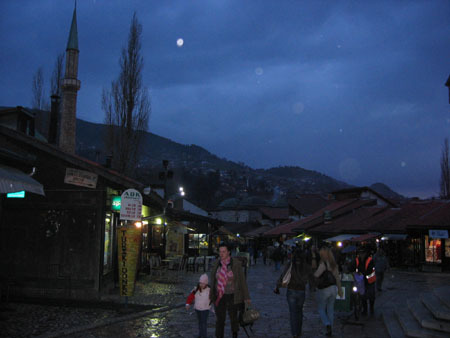 The distance between Mostar and Sarajevo is approximately 130 kilometers and takes 2 hours. I like cars, besides from looking at cars in general I automatically look at licence plates. Of course most of the cars had Bosnian Hercegovina plates, but we also saw Croatian, German, Austrian and even Dutch cars. One thing I did not see at all when driving in Bosnia Hercegovina where Serbian licence plates. Even close to the Croatian border on our way back they were missing. Back in Belgrade I asked a Serb if my impression was correct, he confirmed that most Serbs would not drive with their own licence plates in Bosnia. That explains these strange looks I got when driving there with my Serbian plates. 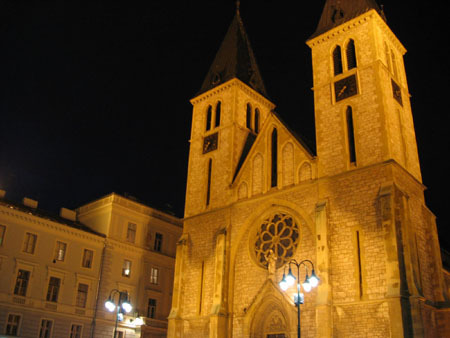 We arrived in Sarajevo around 16.30 and we quickly found a nice hotel in the old historical city center. Hotel Astra might not be the cheapest hotel but it is very decent with good rooms (Addy even had a jacuzzi), good breakfast and again on a perfect location just like our hotel in Zagreb. 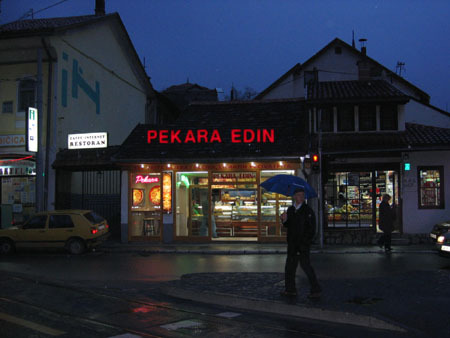 50 meters from Ferhadija, which is the main shopping street, and Saraci where the old shops and restaurants are located. The Gazi Husrev Bey Mosque is located nearby, as well as an Irish pub with Guiness draft (tested, it worked). But we had to test the other beer, Sarajevsko Pivo. These Balkan countries resemble Germany from a beer drinkers perspective, every city has his own brewery. This adds an extra dimension to the exploration of a city. Sarajevsko Pivo is good, but not really strong. 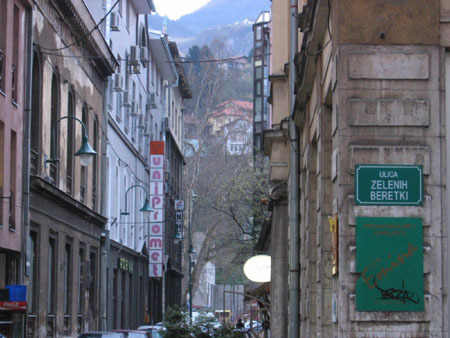 It is a perfect cheap local substitute for expensive import beers, try it if you are visiting Sarajevo. 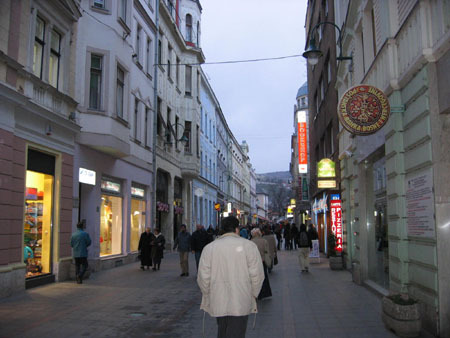 Back in 1997 one of my colleagues worked in Sarajevo and at that time he already told me about the vibrant atmoshpere, shops and restaurants even relatively shortly after the war. 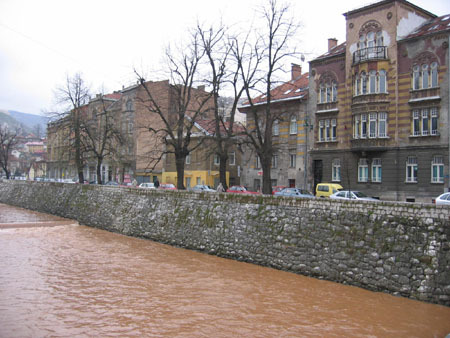 He also told us about the incredible damage in Sarajevo which you could not imagine by television pictures only. Today it is still visible everywhere. Although many buildings are renovated or completely reconstructed you find those bulletholes and shell damage everywhere. Some souvenir shops even sell empty shells decorated with views of Sarajevo, so that's for sure belonging to the category stupid and useless souvenirs. It was a rainy evening so after some shopping we ended up in a small restaurant with simple dishes. I don't know the name of the restaurant but it was located in Dulagina street as far as I can determine by looking at the Sarajevo street map. The food was ok, nothing special but they tried to charge us double. I asked for the bill in Euro's, they gave it in convertible marks and hoped I thought it was the actual euro bill. It can happen everywhere but just be aware of this simple trick. Just smile, ask for the bill in euro's again and of course everything is a big misunderstanding. No tip this time.